Increase hiring effectiveness, drive recruiting efficiency and build a strong candidate talent pipeline by rethinking your approach to reference checking. The competition for top talent grows fiercer by the day. Your organization can’t afford to spend time and resources that result in bad hiring decisions. Organizations want and need predictable and consistent hiring outcomes. What’s more, good candidates are hired quickly. So you need hiring processes and insight that helps you identify the right candidates, reduce time-to-fill, while winning the war for talent. Discover how you can turn reference checking into your secret weapon and drive better hiring outcomes. 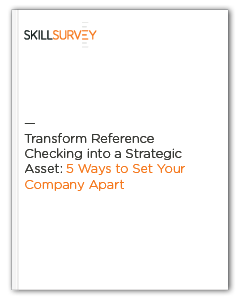 Download Transform Reference Checking into a Strategic Asset: 5 Ways to Set Your Organization Apart. Get access to webinars, eBooks, case studies, and more - delivered directly to your inbox.